I had a show in Belmont with some friends on Mother’s Day weekend, so my kids and I agreed to wait until the 19th. I took a ride up to Rochester on a gorgeous spring day to enjoy my two terrific children and my sweet, little grandson. We played with R a bit when I got there, then it was nap time. While he slept and I supervised (didn’t want to dirty my new shoes – couldn’t have worked that better if I’d planned it), Michael & Amanda planted a trunk full of shade-loving perennials I’d dug up & brought from my yard: lily of the valley, Canadian ginger, lungwort, and Solomon’s seal. They also put in a nice new edging, making the garden look crisp and clean. I should have taken a picture, but didn’t think about it. After the nap, Michael headed to work, while Amanda, R, & I went to the garden center for some veggie plants. R was flirting with people most of the time we were there, and they were all enchanted. Back at home, I got to play with the little one while Amanda got her tomatoes, peppers, and herbs in their large pots for patio growing. As soon as the basil was on the porch, R just had to check it out. 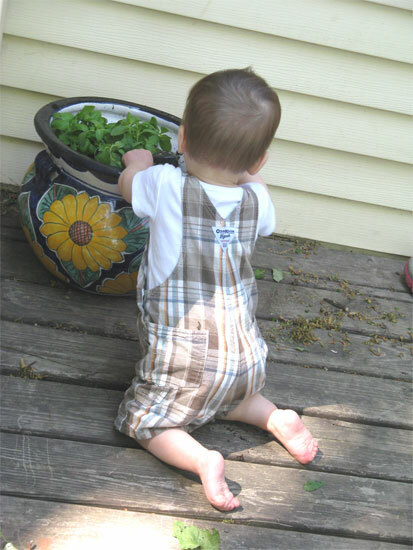 The colorful pot was a big draw, and it was heavy enough that he could pull himself up on it, but it was still a bit too tippy, so it got moved away before he could end up with ceramics, soil, and basil all over himself. In fact, R kept the key tightly in his grasp for well over 1/2 hour. 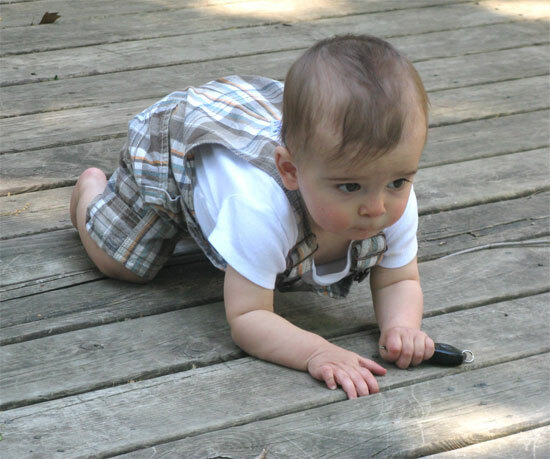 Unlike some babies who need to put everything in their mouths, R needs to shake everything. If it doesn’t make noise by itself, and sometimes even if it does, it will be tapped on everything to produce different sounds. I wonder if this will lead to a career as a drummer? 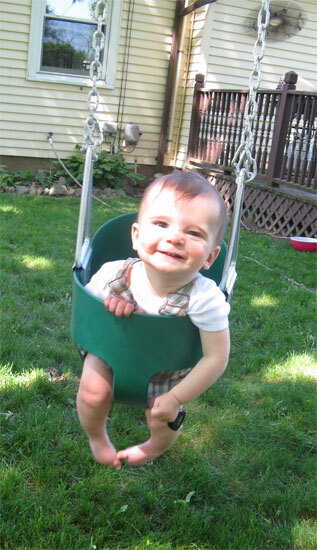 After crawling on the deck for a while, we headed to his swing. That was fun! Notice that he still has the key gripped tightly in his hand. When swinging started to get old, we went back to the porch. 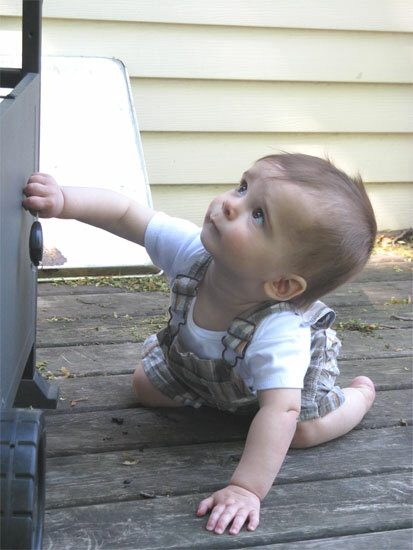 Rusty found something great to tap that key on – the front metal plate of the gas grill – good sounds! We went back inside for dinner, played a bit more, and I headed back home. A great Mother’s Day, if I do say so myself. Your turn: Is it important to you that you celebrate holidays on the calendar-correct date? What a terrific day you had! Yep, I did. That little boy’s a treat to spend time with!